Final Friends of Gainesville is an independent group of community volunteers who provide free education, guidance, and support for a “home funeral” to any individual or family who wants to care for their own deceased loved ones prior to burial or cremation. With the benefit of our knowledge and experience, we strive to make this choice of “caring for our own dead” an easier path for those that find it meaningful and preferable. Caring for their loved ones after death has historically been the duty and privilege of friends and families; but over time families have relinquished this once sacred and spiritual experience to the funeral industry. 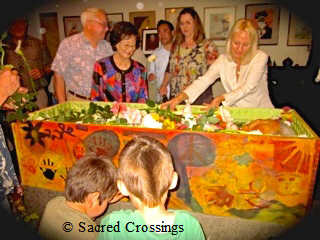 Traditionally, families have washed and dressed their loved one’s body in a home setting, and then placed the body in a shroud or coffin for burial. The current prevalent lack of involvement in the process has contributed to the loss of connectedness of the family to their own rites of passage. It is every individual’s natural and legal right to be cared for by family members, friends, and members of their community. Home funerals are affordable, non-invasive and environmentally friendly. Additionally, one of the most important benefits is the ability of family members, friends and community members to bond and integrate their loss by grieving together in a personal, intimate and comfortable way, allowing the healing process to begin. Considering that there are many options for customizing a home funeral, Final Friends can provide the know-how for families to have a meaningful, safe, and State of Florida-legal rite of passage.